Sidney Crosby was the first overall draft pick by the Pittsburgh Penguins this year! He's rackin' up the points like they thought he would. Playing with Mario Lemieux doesn't hurt. Here's a tip to the hundreds of NHL and European scouts who read Pilgrim Scribblings every day looking for leads. Check out Dawson MacLeod. Great name for a hockey player eh! 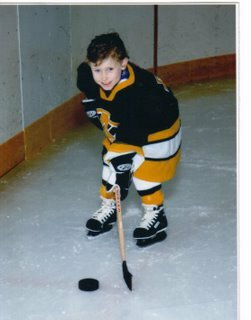 In another 10 years he'll be drafted into the OHL and then two years later the NHL teams will be vying for his services. Check out Dawson's stats at his dad's web site! You're raising a good one, Brodie!